Fast food chain Carl’s Jr. is trying out something a little different with their latest burger. For starters, it’s made out of ice cream and cookies. 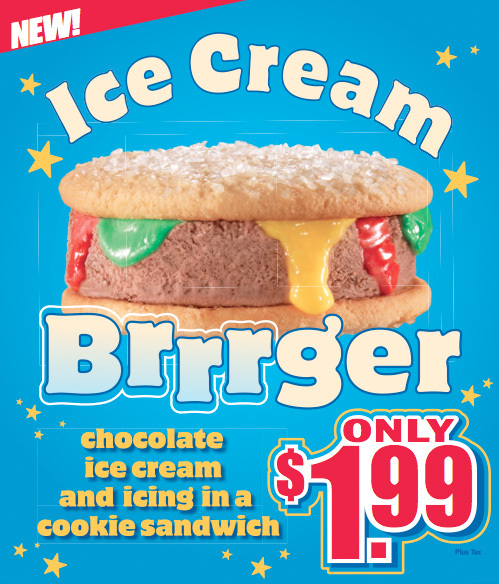 The Ice Cream Brrger is a chocolate ice cream and sugar cookie sandwich done up with icing to look like a hamburger. Avoiding actual hamburger-flavored ice cream was probably a good choice, because while I’d have been all for it, I doubt it would’ve sold well. Unfortunately, the Brrger is only being tested in Orange County, meaning I won’t be able to try it. Ice cream sandwiches have been a pretty big blind spot here on Sandwichtalk, something I hope to fix this summer. If any readers happen to try the Ice Cream Brrger, be sure to let me know in the comments. With a pun this bad, you KNOW it’s good.